Sarah Hammond - Trans Am Bike Race. - LA VELOCITA. 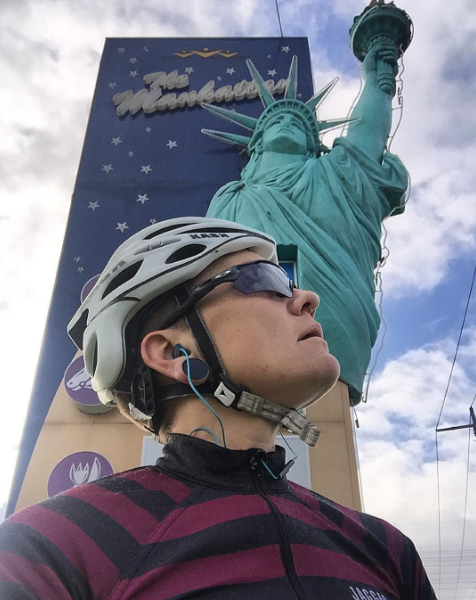 I recently met with Sarah Hammond who, on the 3rd June, started an incredible journey to race the Trans Am Bike Race. The rules of the race are simple. Cycle the Trans America trail end-to-end (basically coast to coast) estimated at 6,800kms, as fast as possible and solo – yes that means unsupported. Her plan is to remain calm, fight against the voices in her head that say stop and keep time off the bike to an absolute minimum. As she says herself she really she has no concept of what she about to face given she is about to embark on the longest ride she has ever done and repeat it every day for 3 weeks. Basically the equivalent of riding two grand tours back to back! Training for the event has involved 24hr rides (including riding the Oppy event earlier this year – she and her team broke the record in that event – well almost, but that’s another story) and almost non-stop overnight tests including riding to Adelaide over 36hrs. There will be some hefty obstacles on route - McKenzie’s pass had snow on it a few weeks ago. Rockies are over 3,000 metres in elevation. Not to mention where she might sleep. A close friend and mentor of Sarah’s has been Jesse Carlsson who won last year’s event. Jesse has given Sarah heaps of advice on what to expect and what to take. He has served as a key motivator and will be a one of her biggest supporters as he watches her progress. So if you are anything like me I wanted to know who exactly does an event like this? Sarah is looking forward to doing something totally out of the routine, no work, no keys, just the wide open road and one hell of journey. She talked about needing to take a risk and importantly do this for herself. Sarah sets her the bar very high and said she feels she has often fallen short of her own expectations of herself, she is very keen to challenge this. She’ll miss her Bulldog Flex and nail polish. Lip balm, sunscreen and hand sanitiser will be the essentials but that’s about it for creature comforts. What an incredible accomplishment to even put yourself up for an event like this – I have a huge sense of admiration for her and get a feeling she will come back achieving way more than she set out to. Follow her on Instagram – flexgoogly. Loved this story.... I'm blown away at the courage this ride will take. Want to hear more? Well drop your email in below. Thanks! LA VELOCITA. THE WEEKLY RIDER.